I love looking at them. Talking about them. Picking out designs for them. And hearing the story (if there is one) behind why someone decided to get one done. Every couple of months or so, I get the itch to get another one done. Most of the time, I'm able to ward off the urge to get more ink. In fact, the last time I had one done was 2009. The reasons for not getting one range from not having the extra cash to do so, not being able to totally commit to the design and/or location and not having a regular tattoo person to visit to get the work done. Lately, that itch has been a little too hard to ignore and it's time to get a new one! And that is happening tomorrow. I'm so excited but ya'll will just have to wait until it's been completed. One of the things I love the most about tattoos are the stories they can tell. And even in some cases, not tell. My tattoos fall into both categories. Ladybug: This was my first tattoo. It's small and I tend to forget that I even have it. I got it done when I was 19 in my "I'm free and I'm young!" phase shortly after my first piercing. It's not the greatest--I went to a guy who actually had a really good reputation and had done previous pieces for friends but wasn't thrilled with having been asked to do "a little $40 job". Flowers & Butterflies: Ahhh, yes. The dreaded "tramp stamp". I do love this one. When I had it done, I just wanted something girly and pretty. Not that you can tell from the black and white photo, but it's done in my favorite colors-blues and pinks. There are days when I think about trying to incorporate into a larger back piece but most days I am happy just the way it is. Star: I got this one done when I was in New York back in 2001. My bff at the time (we are not longer bff's or even just an f anymore) and I had matching ones done. But it wasn't on purpose. I picked it out as it was going to eventually be colored and turned into a compass and she followed suit. 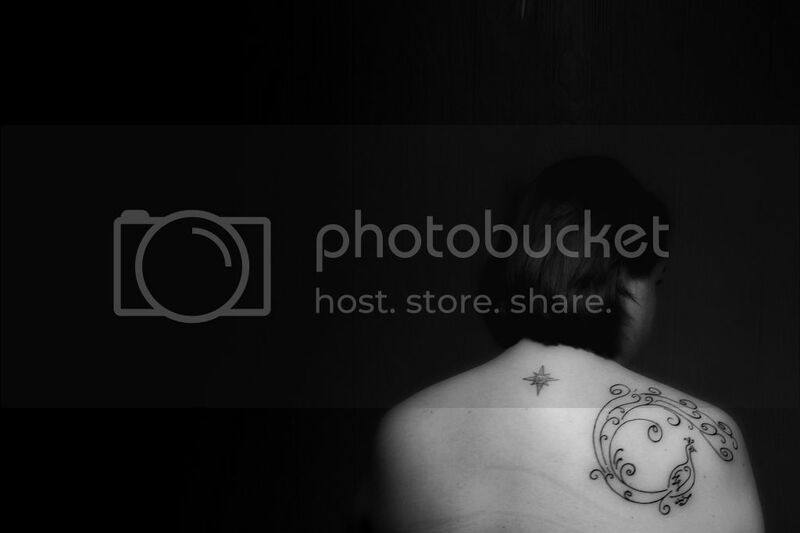 But, like the one on my lower back, the longer I've had it "plain" the more I can't bring myself to change or add to it. Peacock: This is the tattoo everyone loves, and I mean LOVES to touch. I am no longer phased by folks pulling on the straps of my tank tops or the neckline of certain shirts to get a better look at it. It is my favorite as well, so who can blame them. The decision to have this one done was pretty much a no brainer. I had been wanting to get a peacock done for awhile, but at the time didn't want a full color done (now of course, every time I see one that is done in full color a little part of me wishes I had taken that route). When I saw this design, I knew it was exactly what I was looking for and had it done. And now I'm just a day away from having my next piece done and I can't wait. I'll be sure to share my next tattoo story as soon as it is done and healed, which thankfully shouldn't take long. This one is just a little something to tide me over until I work on my next (big) piece. Do you have a tattoo story? Each of mine has a story - or at least a meaning - as well. The one on my lower back is a star and flame to commemorate my *NSYNC fandom. The treble clef and eighth notes were next. Logically. And the baseball heart is an homage to the role baseball plays in my life. I got it the first year I ever went to Opening Day at Rangers Ballpark. Exciting times. I want another so bad. Haven't decided exactly what or where though. I'd love to get a baseball themed tattoo--I keep thinking the Old English D for my beloved Tigers, I just don't know where I'd put it.